"While moulding relief, the Court can go to the extent of relaxing the application of law to the parties or exempting altogether the parties from the rigours of the law in view of the peculiar facts and circumstances of the case. This being so, it is clear that this Court has the power, nay, the duty to do complete justice in a case when found necessary. In the present case, crimes which shake the secular fabric of the Constitution of India have allegedly been committed almost 25 years ago", Justice Nariman said in his Judgment. 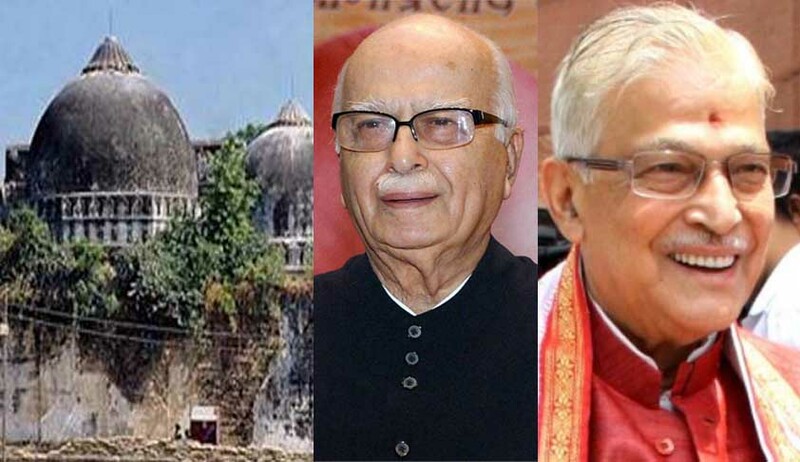 Delivering a significant verdict with massive political ramifications, the Supreme Court today has restored criminal conspiracy charges against senior BJP leaders L K Advani, Union Minister Uma Bharti, Murli Manohar Joshi and 13 other leaders in the 1992 Babri Masjid demolition case. "We allow the appeal filed by CBI", the court said ordering that additional charges against Advani , Joshi and others be framed within four weeks. Invoking its extraordinary constitutional powers under Article 142 of the Constitution, the bench of justices P C Ghose and Rohinton Nariman also transferred the pending separate trial in a Rae Bareilly Magistrate court and clubbed it with criminal proceedings in the Lucknow CBI Court. The trial court has been directed to hold day-to-day trial without any adjournment and pronounce judgment within two years. The bench said one of the accused Kalyan Singh will obtain constitutional immunity being the Governor of Rajasthan but as soon as he relinquishes office, additional charges shall be filed against him. The proceedings viz. Crime No. 198/92, RC.1(S)/92/SICIV/ND in the Court of the Special Judicial Magistrate at 38 Rae Bareilly will stand transferred to the Court of Additional Sessions Judge (Ayodhya Matters) at Lucknow. The Court of Sessions will frame an additional charge under Section 120-B against Mr. L.K. Advani, Mr. Vinay Katiar, Ms. Uma Bharati, Ms. Sadhvi Ritambara, Mr. Murli Manohar Joshi and Mr. Vishnu Hari Dalmia. The Court of Sessions will frame additional charges under Section 120- B and the other provisions of the Penal Code mentioned in the joint charge sheet filed by the CBI against Mr. Champat Rai Bansal, Mr. Satish Pradhan, Mr. Dharam Das, Mr. Mahant Nritya Gopal Das, Mr. Mahamadleshwar Jagdish Muni, Mr. Ram Bilas Vadanti, Mr. Vaikunth Lal Sharma @ Prem, and Dr. Satish Chandra Nagar. Mr. Kalyan Singh, being the Governor of Rajasthan, is entitled to immunity under Article 361 of the Constitution as long as he remains Governor of Rajasthan. The Court of Sessions will frame charges and move against him as soon as he ceases to be Governor. Things looked bleak for the BJP and RSS leaders when on April 6, the day the apex court reserved orders the CBI submitted that conspiracy charges needed to be restored against them as there was “prima-facie evidence”. "The impugned order of the Allahabad High Court upholding the lower court order dropping the charge of conspiracy ought to be set aside", Additional Solicitor General N K Kaul had said commencing CBI's arguments in the plea challenging dropping of charges against BJP and RSS leaders. "In any case 120B should go on and they have to be tried somewhere", Kaul told the bench. During the hearing Justice Nariman had asked what was the way to get over the technical defects on the ground of which the charges were dropped. Noting that the pendency of the cases in Lucknow and Rae Bareilly courts itself indicates “evasion of justice”, the court had proposed to invoke its extraordinary constitutional powers under Article 142 of the Constitution to transfer the pending trial in a Rae Bareilly Magistrate court and club it with criminal proceedings in the Lucknow CBI Court against “lakhs of unknown kar sevaks”. The court indicated that it will order the CBI Court to conduct a time-bound trial and complete it in two years. So far 195 witnesses have been examined in the Lucknow case while a whopping 800 witnesses remain to testify. In Rae Bareilly, 57 witnesses have been examined while 105 wait their turn in court. Advani, Joshi and six other politicians were originally accused in the Rae Bareilly case for giving provocative speeches. Besides the CBI plea for restoring the charges, the court was also delivering verdict on separate petition filed by one Haji Mahboob Ahmad, President of Mahafiz-Masjid-Wa-Maqabir’ and Muddai BabriMasjid which claimed that with the BJP regime and a “participant” Rajnath Singh as Home Minister, CBI, the original petitioner against dropping of criminal conspiracy charges may not press for its restoration. Earlier the court had asked CBI why conspiracy charges cannot be restored against BJP and RSS leaders L K Advani, Murali Manohar Joshi, Uma Bharti, Kalyan Singh, Vinay Katiyar and 15 other leaders . It had also hinted that it would club the two separate hearings going on in Rae Bareli and Lucknow courts.